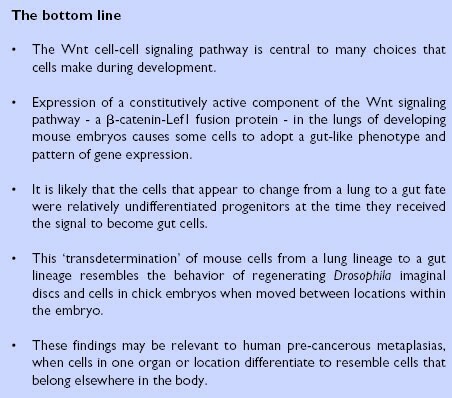 Constitutive activation of the Wnt signaling pathway during lung development in mouse embryos causes some cells to develop a gut-like phenotype. These findings are reminiscent of classical embryological experiments and may have therapeutic implications for pre-cancerous metaplasias. When embryologists began cutting and pasting pieces of chick embryos into new positions back in the 1950s and 1960s they sometimes noticed bizarre changes in tissue types but had little notion of what was going on at a molecular level, and even less idea of how to investigate it. Likewise, clinicians have puzzled for many years over pre-cancerous conditions called metaplasias, in which cells appear in one part of the body that normally belong in another. Neither group could get a handle on how cells escape the usual 'rules' that tell them which types of tissue to form in which part of the body. Now, researchers from Duke University Medical Center have contributed to a new awareness of the molecular signals that could explain these phenomena (see 'The bottom line' box for a summary of the findings); furthermore, their data suggest possible ways to manipulate stem cells of adult tissues, to make them develop into the tissue of choice for therapeutic purposes. Tadashi Okubo and Brigid Hogan  report in this issue of Journal of Biology a surprising result from their studies of the Wnt signaling pathway, a central cell-cell signaling pathway during development (see the 'Background' box). If a key component of this pathway is expressed in active form in the lungs of developing transgenic mouse embryos, cells appear within the lung that are more like cells of the gut than they are like their lung neighbors. 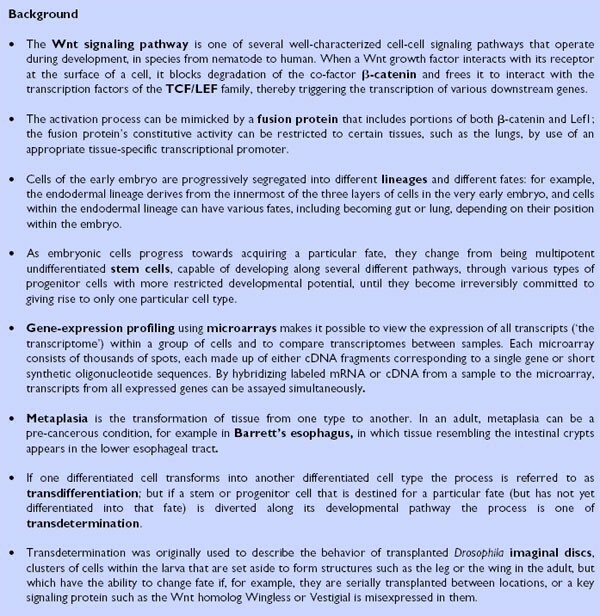 The lung cells in the transgenic mice seem to have switched developmental pathways to become part of a different lineage; the lungs appear grossly normal at first, but they contain far fewer than normal of the usual fully differentiated lung cell types. By microscopy alone it was initially hard to say what had happened to the specialized lung cells that should have lined the airways and alveoli, but gene-expression profiling using microarrays revealed the activity of genes that are normally expressed only in intestinal epithelial cells. "We nearly fell off our chairs when we saw all these intestinal genes coming up," says Hogan. She and Okubo had set out to study the Wnt signaling pathway in developing embryonic lungs. Among its many functions, this pathway is important in cell-to-cell communication during development, but its precise role in the embryonic lung remains to be fully understood . The component they chose to focus on was β-catenin, an intracellular protein that conveys signals from the Wnt receptor at the cell surface into the nucleus, where it switches on the activity of new genes via the action of transcription factors of the TCF/LEF family, such as Lef1. By expressing a constitutively active fusion protein made up of β-catenin and Lef1, in effect Okubo and Hogan mimicked the effects that Wnt ligands might have upon binding to receptors at the cell surface. What they found was that high levels of Wnt signaling at the wrong time can dramatically alter the developmental pathway a cell takes. 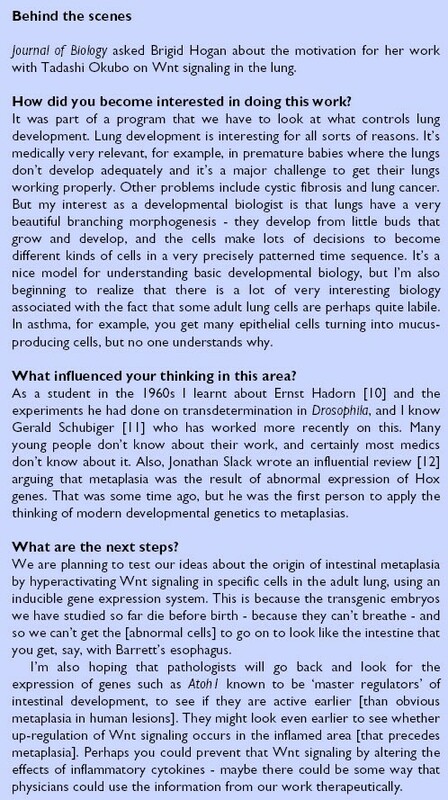 Hogan believes the results could help us to understand the origins of some human metaplasias, in which cell types appear in parts of the body where they don't normally belong, and which can lead to cancer (see the 'Behind the scenes' box for more of the rationale for the work). In the bladder, for example, some patients develop kidney- or intestinal-like tissue. And in idiopathic pulmonary fibrosis, a severe form of lung metaplasia, cells resembling those of the bronchioles - cuboidal in shape and with a secretory or ciliated appearance - arise in the distal airways that should contain only flat alveolar cells. Although it may be triggered by inflammation, the condition is poorly understood and the outlook for patients is bleak, notes Wellington Cardoso, a pathologist at Boston University Medical Center who researches lung development. "The prognosis is terrible. Perhaps understanding better the signaling pathway involved in this kind of transformation will help to find a cure or at least some kind of intervention." Researchers investigating this and other forms of metaplasia, including Barrett's esophagus, have detected that the abnormal tissues have high levels of Wnt signaling components, including β-catenin and the downstream transcription factor Cdx1 [3, 4]. But whether these represent a cause or effect of the formation of abnormal tissue has remained a mystery. Okubo and Hogan's results  help to place such signals into a possible sequence of events. "Studies of metaplasia are mostly being done in clinically related research, and no one has really come up with a model for what could be the first thing that's going wrong," says Hogan. "We would argue that because of local injury and inflammation there is local up-regulation of Wnt signaling and the activity of β-catenin, and that this is then switching some of the cells to become progenitors of intestine." Hogan suspects that some of the growth factors switched on in the abnormal cells may drive a higher rate of proliferation in the metaplastic cells, making it more likely that genetic mutations could gain an advantage over time. "Maybe mutations come secondarily: once you get higher proliferation you may increase the chance of mutation arising in genes associated with cancer in the intestinal tract," she suggests. The new findings also open a number of different avenues of investigation. One question is whether the cells that give rise to the metaplasia are progenitor or stem cells, or a more differentiated cell type. Because of the way their experiment was set up, Hogan favors the notion that the aberrant cells detected in their transgenic mice are likely to have come from relatively undifferentiated lung progenitors, rather than from cells that had already differentiated into mature lung cells, and that the same may be true in at least certain types of human metaplasia. "It would detract somewhat from the impact [of our findings] if you argued that these embryonic [mouse] lung cells can switch their lineages only because they have not yet completely shut down all their developmental options, and that their plasticity is not really relevant to adult human tissues. But we like to think that perhaps in human metaplasias the lineage switching initially occurs in relatively undifferentiated tissue stem cells that are behaving somewhat differently to mature cell types," she says. Accordingly, Hogan has adopted the term 'transdetermination', coined originally to describe the behavior of regenerating cells of the imaginal disc in Drosophila larvae, rather than 'transdifferentiation', which refers to the switching of developmental fate in more fully differentiated cells. She acknowledges, however, that in other forms of metaplasia, such as can occur in asthma, the switch is more likely to involve differentiated cells. But if stem cells are the precursors of the abnormal cells in metaplasias, the new findings could help answer questions about where these stem cells normally reside and how important their location is to their fate - an important issue in itself, according to Cardoso. "People are looking like crazy to identify stem cell niches. There are still not definitive answers to this because we lack definitive markers for stem cells." The findings also reveal something of the delicate interplay between the timing and nature of signaling in determining cell fate. For example, the absolute levels of expression of Wnt signalling components may be a deciding factor, as Hogan explains. "There might be a window of time when an embryonic cell has to have a certain level of Wnt signaling and that says 'OK, proceed to be progenitors of lung' and it's important that you don't get Wnt signaling above this threshold level: if you disrupt it in some way you could get lineage switching. We don't know what level of expression of the fusion protein we had, but it's possible that if we had a slightly higher or lower level we might have obtained other endodermal lineages." Other groups are also finding evidence that Wnt signaling is important for differentiation and lineage switching. Elaine Fuchs and colleagues at Rockefeller University in New York, for example, have disrupted Wnt signaling to produce sebaceous gland formation inside mouse hair follicles , while Fiona Watt and colleagues from Cancer Research UK found that the level of β-catenin determines whether keratinocytes in the skin differentiate into hair follicles . And Lothar Henighauser and colleagues at the National Institutes of Health used over-expression of β-catenin to create areas of keratinized skin in mouse prostate glands . Together, these studies could provide an important bridge between developmental biology and stem cell research, according to Lee Niswander, of the Memorial Sloan Kettering Cancer Center in New York. "It would be really fun to see how these results can inform stem cell biology, and capitalize on these ideas. We all laugh in the developmental field that there are about five key signaling molecules that can regulate so many things in embryonic development - Wnt, FGF [fibroblast growth factor], TGF-β [transforming growth factor-β], Hedgehog and Notch. In all different stem cell lines you need these signaling components at some level and at some time to drive differentiation, but what we really don't understand is how to drive specific differentiation." Hogan hopes the new data may provide clues for how to use stem cells from adults for therapeutic purposes. "If you could take a biopsy of an adult tissue like the intestine, where we know there are stem cells, grow them in culture, and expose the dividing stem cells to a cocktail of signaling factors, it might be possible to switch them into progenitors of other endodermal tissue types, but this is a long shot," she says. But, according to Cardoso, perhaps the most interesting aspect of looking at Wnt signaling may be in shedding light on some of the earliest observations about metaplasia. In the 1950s, embryologists treated the skin of chick embryos with retinoids (vitamin A derivatives) and could produce patches of respiratory epithelium with secretory cells and beating cilia . Conversely, researchers have also described rats in which vitamin A deficiency produces the opposite effect: parts of the trachea are transformed from respiratory epithelium into squamous epithelium . "Many of the big observations have already been made, but people at that time had no idea of how to proceed or get into a mechanism. Who knows if at least some of these are related to Wnt signaling or not, but we have to look at this more carefully," says Cardoso. And with the advent of genome manipulation and large-scale screening for gene activity, finding the molecules that underlie these crucial developmental and pathological events is beginning to become a reality.